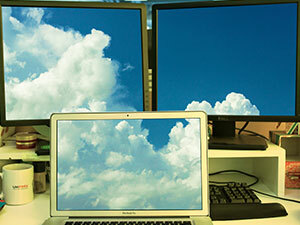 In our new role as weather people, we’re looking skyward to predict the next five years of cloud computing. And, by the looks of it, it’s going to be raining awesomeness. Uptake of cloud by businesses has increased by 75% since 2010, and by the end of this year 86% of businesses expect to adopt the tech in some form, which means that those of you already looking to the future will be firmly ahead of the game. Our most recent whitepaper goes in-depth on cloud forecasts, sharing insights on how to ensure your business is killing it with cloud, with exclusive comment from tech big hitters like Microsoft and Cisco. The cloud is maturing, and businesses will have to change along with it – those that don’t could find themselves struggling to keep up. We’ve done some investigating to see which way the winds are blowing, speaking to industry experts to put together the six developments that we think are going to be taking the floor over the next five years. Our first whitepaper prediction, to get you started, is on the role cloud will play in increasing flexibility in working. Nowadays, employees kinda expect to be able to work from anywhere, but data security and privacy isn’t keeping up, holding businesses back from getting on board with BYOD (Bring your Own Device). Our whitepaper experts predict that BYOD will become the norm but there are fears around security that are currently holding it back. In the whitepaper we discuss the platform that offers the flexibility of BYOD yet remains safe. BYOD means that companies aren’t limited by location – it makes remote working and collaboration easy, and employees can work on the go. On the flipside, USB sticks left on trains, where to draw the line between personal and professional usage, and various other concerns can hold businesses back from enjoying these benefits. Enter cloud. Working together virtually means data can be stored in the cloud rather than on employee devices, removing the headaches that data breaches cause. DaaS (Desktop as a Service) and VDI (virtual desktop infrastructure) are new terms that you’ll start to hear on the grapevine – our whitepaper will make clear how your business can use them to become more efficient and more flexible. Cloud is becoming a focus for businesses in all areas; as we move towards this bright future, organisations need to decide how cloud fits into their business, how they can use it for the maximum effect and, ultimately, which hosting partners offer what they need to succeed. Download our whitepaper for all six cloud predictions and expert insights!